As I had already foretold, political considerations have made the Government approve the constitution of VII Central Pay Commission. 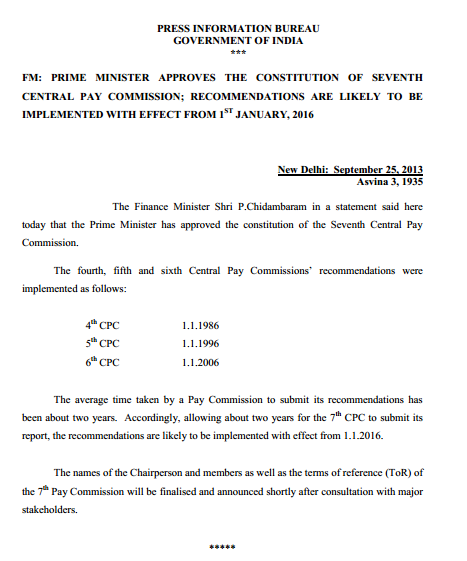 Prime Minister Dr.Manmohan Singh, today approved the constitution of the 7th Pay Commission. The Government will now issue a notification regarding the constitution of the commission, its terms of reference and the members. The entire process could take upto 1 month and the Pay Commission should be constituted in the month of November, 2013. The Commission will then have 2 years to submit its report to the Government. However the implementation of the 7th Pay Commission will be in the hands of who ever is elected to the Lok Sabha with majority in the General Elections 2014. If the party which wins the elections has absolute majority, we can expect the pay commission to be implemented well on the targeted date i.e. 1.1.2016. But that is the hypothetical scenario. Right now the news is that the Pay Commission has been approved with the polls in mind and round about 80 lakh voters plus their families. In a separate breaking news, the Government will increase the retirement age of the Government employees by two years to 62 years. The retirement age order should be enacted on 8th October 2013 however the affect of the order on those personnel retiring before October, 2013 is not clear as of yet. Delhi and Chhattisgarh have already decided to enhance the retirement age of their employees to 62 years. Hi Vijay, Was there any decision taken on October 8th regarding retirement age to 62? There has been no announcement yet. Sir, then it is most likely that they may not increase the retirement age, because there is too little time to decide now. Its been 3 weeks now that the file has been put up to Ministry of Finance, still no decision has been taken. Or do you feel they may announce it just before the election dates are decided by the EC? Hi Anon I am certain the UPA will let go atleat 10 lakh votes (people who are retiring soon) go to opposition. 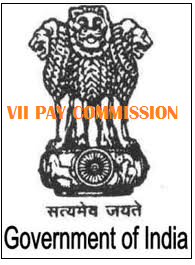 I had predicted the approval of VII CPC way back in Feb 2013 http://www.comboupdates.com/2013/02/7th-pay-commission-for-central.html when nobody believed it possible including you. Hi Vijay Sir!! There have been rumours among Ordinance Factory employees that, retirement age of CG employees will be increaded to 62 in Jan or Feb, after the vidhan sabha elections of five states. Is it true sir? No chance to increase of retirement age of central employee. If yes,please inform me whether any possibility to increase the retirement age of central govt. employees from 60 to 62 before January-2014? source of news from M.P. I am sure that no chance to increase retirement age 60-62 before lok-sabha election -2014. It is hard but the truth is the next government would be BJP, who is never against hiking retirement age. There are record number of employees, who are on verge to retire in the next 2 years. Considering the fact that the last retirement age which was enhanced from 58 to 60 was done by BJP Government and the UPA has created negativity among the employees as they were many rumours about the increase in retirement age to 62. Now in present situation the employees are very dissappointed and wants to hike the retirement age to 62. So the best option for the UPA Government is to raise the retirement age and consider the vote bank of the to-be-retired employees and you may come into power. Unless this, It is practically impossible for UPA to survive as there is lot of negativity among Central Govt Employees. And as far youth is concerned it would not impact them as just 4% of Indian job market has central government jobs!! And it is already proven that just 30% of youth only would caste their vote and various surveys reveal that they are seeking for change in Government. So the final verdict is, Raise the Retirement age to 62 and capture the vote bank, if you UPA wants to come into power in 2014!! There are strong Rumours that they may increase the retirement age to 62 in January 2014. So the final verdict is, Raise the Retirement age to 62 and capture the vote bank, if you UPA want to come into power in 2014!! Hi Vijay !! Any decision on retirement age 62 expected before 31st Jan? Strong rumours going around here. On the eve of lok-sabha election, U.P.A Govt.Should consider the enhancement of retirement age from 60 to 62 age before 31st january 2014. In as much as U.P.A Govt. will be benefited to a large extent in all respect. Hope , Central Govt. will take positive decision very shortly in this matter. Hi Vijay !! Now that DA merger of 50% being considered by UPA, any chance of retirement age 62 by Feb? Hi Anon yep hope that UPA-II approves both by 14th Feb :) Because UPA will be announcing elections in end Feb so that gives government 1 month to clear all pending issues. Its high time now,cn we expect somethng good coming up?? does govt has such policy in its agenda or its just a rumour ? govt. should not increase of retirement age and i think it is not good for new generation. because they have no work and they are catching wrong way.